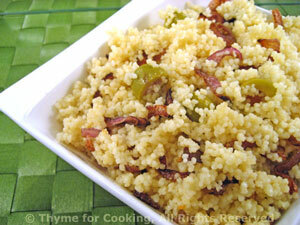 Thyme for Cooking Couscous with Green Olives and Browned Red Onions. A slightly sweet red or Spanish onion is fried until well browned, making it sweeter and a nice balance to the slightly salty olives. Add butter and oil. When butter is melted add onions, laying them as flat as possible. Let sauté, undisturbed, for 5 minutes or until starting to brown and soften. Stir, reduce heat and continue to sauté until well browned, another 15 - 20 minutes. Uncover, add onions, olives and vinegar, fluff gently with a fork to combine and serve.